Tickets are now available for the School's Out Workshops in December 2014! Check out the full program below or download your own copy here! This December, you can have a ball getting creative in a whole range of exciting workshops including Puppetry, Fabric Painting, Paper Crafts, Pottery, Origami, Dance, Jewelry Design & Crafts. We are excited to announce that we have partnered with Camp Kreativ to also bring you a specialised training and development program in drama and puppetry. Workshops are available for children and young people aged from 18 months to 13 years. A maximum of 15 participants can attend each session. Tickets for School's Out workshops are 300/- per child per session. Tickets for Playgroup Sessions are 200/ per child per session. Tickets for Camp Kreativ are 500/ per child per session. These ticket sales enable us to donate at least 30% of the total School's Out Tickets away each holidays free of charge to children in need. We thank you for your support. 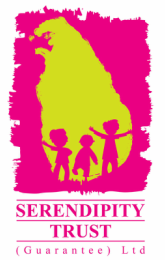 All School's Out Workshops are held at Serendipity House, 32 Cripps Road, Galle. Click here to register your child's interest the December School's Out Programs or call us on 091 2248086. Please note tickets can not be secured until payment has been received. Enjoy a range of creative activities inspired by nature to create your own colourful illustrations and designs. A twice weekly Playgroup for young children and their parents offering a wide range of sensory play, art & craft, music and outdoor activities. Learn the ancient Japanese art of paper folding in this fun and creative workshop. Join talented jewelry designer Sara Nazoor to create your own unique pendants and earrings. Young participants will have a great time getting messy and creating their own colourful paintings and gift cards using everything from sponges, toy vehicles, leaves, flowers, balloons and many other household items! Measure, Mix, Knead and Roll! This fun workshop will have young toddlers and their parents creating their own balls of colourful play dough before transforming it in to beautiful creations! Join Sulakshi to create special handmade gift cards to share with your loved ones this Christmas! Make a fashion statement by creating your own special purse or wallet using colourful foam cut outs. Want to give a special gift this Christmas? In this workshop you can design and paint your own terracotta pot and also make a special gift card for a friend or family member. Get crafty in this fun workshop where you will make unique decorations for your Christmas Tree! Dance your wiggles out! Join Chanu is this fun and energetic dancing workshop! Parents are very welcome to join in. Participants: 18 months to 4 years. Learn a variety of unique techniques to create beautiful patterns and designs. Sinbad and the Seven Seas! Explore the history of our beautiful country through a sailors spyglass! From the Arabian Nights and Sindbad the Sailor this session will focus on story telling of tales of old and will include fun singing and writing activities. Each child will create their own set of 4 ceramic drink coasters by using techniques such as painting & collage. The finished creations will make a great Christmas gift! Participants will create special bags and other items out of colourful and decorated papers. Use colourful felt, googly eyes and coconut items to create fun and interactive puppets! Create unique and colourful pen holders, candle holders or useful containers by decorating glass jars. A great Christmas gift item! 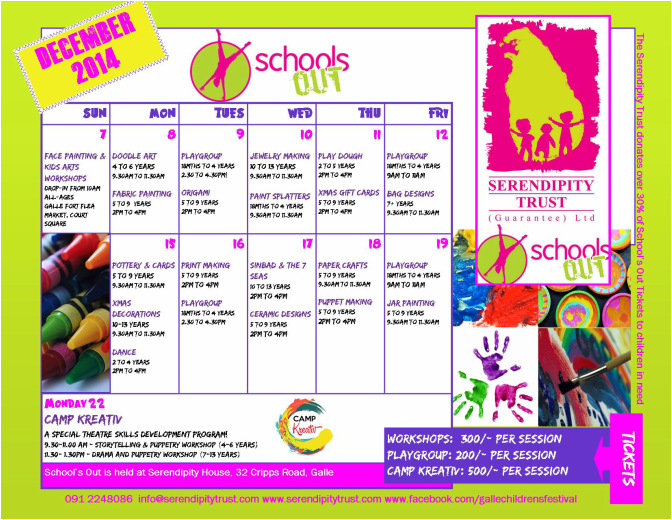 Power of Play in partnership with the Serendipity Trust (Guarantee) Ltd is excited to introduce Camp KREATIV - a unique holiday program on Monday 22nd December 2014 at Serendipity House, 32 Cripps Road, Galle. Camp Kreativ offers theatre skills development workshops which ignite interest in participants to investigate deeper in to their passions. Comprehensive workshops in puppetry & drama will be facilitated by professional puppeteer Sulochana Dissanayake who has successfully ventured off the beaten path to establish a contemporary career in theatre and puppetry. Camp Kreativ aims to impart practical knowledge in a non-competitive environment, to develop analytical skills vital for holistic development of participants.